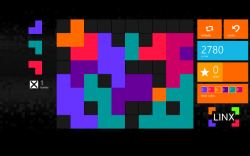 Each triangle you place gets you more points… but the screen fills up quickly! Link L shapes into rectangles of 3×2 or bigger, but beware that each rectangle then turns into another L–of a different color. This keeps you running and running, until the board inevitably fills up. Linx is easy to start. You just place an L from your ? bank next to another to form a rectangle. The rectangle will disappear, leaving another, differently colored ? in its place. You’ll then start to receive Ls that are the new color. 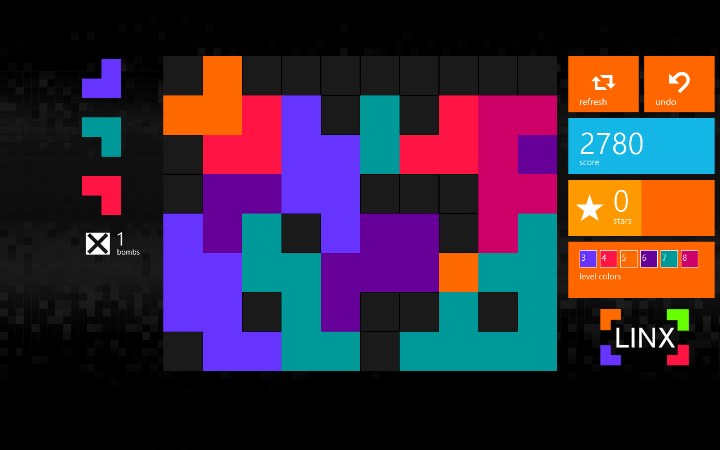 Right now, the only game mode available is Marathon, in which you need to form as many rectangles as possible. I managed to get a score of 4199, which is paltry compared to the global daily top of 16001. There are over 200 possible colors in LINX, and it’ll take you a while to get through them all. It’s a fun game, and seems like it definitely has the possibility to stay fun over time. It’s definitely a game of skill, and there’s lots of opportunity to help you grow your skill.